Campaigners are furious the government appears ready to give the go-ahead for the use of genetically modified crops. Qualified approval for GM maize is imminent, Cabinet meeting minutes seen by BBC News show - although ministers say no final decision has been made. Patrick Holden of the Soil Association said it would be "a great tragedy". But Dr Julian Little, of the Agricultural Biotechnology Council that represents GM firms, said GM maize was "at least as safe" as non-GM crops. 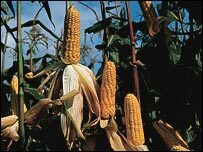 The sowing of GM maize could jeopardise the ability to produce GM-free crops, Mr Holden - who campaigns for organic farming - told BBC Radio 4's Today programme. It would also lead to widespread commercialisation with environmental consequences, he warned. He claimed the government's own research had concluded there was no economic case and the public were against it. Friends of the Earth director Tony Juniper said the government was desperate to show Britain was not "anti-science". Former environment minister Michael Meacher told the BBC: "It is not necessary. It is not wanted by people. They are not going to buy it". He asked: "Why are we rushing to do something which has a huge downside risk and has no consumer benefits?" Andrew George, Liberal Democrat rural affairs spokesman, said: "If the public realised what was being decided in their name, there would be uproar". A spokesman for the agricultural ministry Defra told BBC News Online: "Ministers are still considering the issues around the GM policy statement. They haven't reached final decisions." He said there would be an announcement "shortly" - adding it would not be this month. FARM SCALE EVALUATIONS - WHAT WERE THEY ABOUT? According to the Cabinet minutes, seen by BBC Two's Newsnight programme, ministers predicted public opposition - although Environment Secretary Margaret Beckett was said to have argued there was no scientific case for a ban. The document said a pro-GM campaign targeting key MPs would precede any policy statement to Parliament. "Opposition might eventually be worn down by solid, authoritative scientific argument," it said. The leaked minutes came as researchers said a national debate about people's views of GM crops probably exaggerated the strength of anti-GM feeling. The government-funded GM Nation? report said the public mood "ranged from caution and doubt, through suspicion and scepticism, to hostility and rejection". But a team of academics from Cardiff University, the University of East Anglia (UEA) and the Institute of Food Research said the project had overall been over-hasty and under-resourced. A Mori poll of 1,363 people for UEA found 36% opposed GM foods, 13% were in favour and 45% thought they could have future benefits. Paul Rooke, head of policy at the Agricultural Industries Confederation, welcomed the move towards growing GM maize commercially and said he hoped an announcement would follow shortly. He told BBC News Online: "The maize variety has undergone all necessary safety assessments required and is safe as its non-GM counterparts. "The marketplace will determine the success of GM crops commercially." The Agriculture Biotechnology Council's Dr Little told Newsnight the safety of GM maize had been demonstrated "time and time again". "And it is now time to actually go forward," he said. Professor Vivian Moses, of pro-biotech campaign group CropGen, said most people were "uninterested" in GM and "do not bother to read labels". "We're right on the brink of decision time"